For the AI counterpart, see Patriarch (Killing Floor 2). 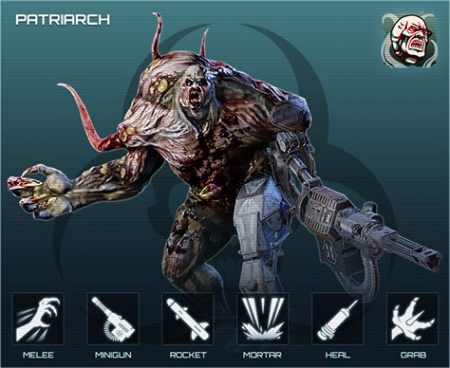 The Patriarch is playable in Killing Floor 2's Versus Mode at the end of a standard 4-wave match. A random player on the ZED team will be given control of the Patriarch during the boss round. Like the AI counterpart, the playable Patriarch boasts a wide variety of attacks and weapons, able to deal damage at range and at close combat. He also possesses the ability to summon lesser ZEDs (controlled by the other players on the ZED team) by dealing damage to the Survivor team. Unlike the AI Patriarch, the playable Patriarch does not need to retreat from combat to heal - he can pop a healing syringe in the middle of combat and immediately resume fighting. Due to Game Conductor mechanics, player-controlled Patriarch has its health modified based on the average level of the Survivor team. Values vary within (x0.85 - x2) range. The Patriarch has his health value scaled accordingly to the number of players in the game. This increase in value is massive per player (+50% of the base value). The Patriarch's base health value is 1680 for 1 player. The player-controlled Patriarch has the same resistance values as the AI controlled Patriarch. The player-controlled Patriarch has the same weakspots and armored spots as the AI controlled Patriarch. Primary (while standing/walking): Slashes with his tentacle arm twice, a light attack. Primary (while sprinting, uncloaked): Swings his armored left arm in a wide arc, a heavy attack (also performed if LMB is pressed while airborne). Primary (while sprinting, cloaked): Performs a charging shoulder ram while traveling forward. Primary + Left OR Right: Performs a spinning clothesline dealing damage and knocking away all nearby targets. Primary + Back: Kicks forward. ADS button: Fires the minigun - Hold down RMB to shoot longer. Secondary: Fires the missile launcher. Grenade button: Fires 3 Mortar shells into the air that track a random player within range, each. Cannot be used when there are no valid targets around your position. Heal: Heal yourself back to full health with a healing syringe; can only be used 3 times. Note that if you do not use a healing syringe when you fall below 25% health, the game will automatically try to heal when you are not performing an action. Passive: Automatically cloaks upon sprinting if cloaking is not on cooldown. Melee. Damage - 25. Maximum hit range - 3.75m. Cooldown - 0.5s. Minigun. Damage - 10. ROF - 1000. Cooldown - 4s. Missile. Damage - 70 (direct hit - 200). Radius - 6.5m. Falloff - 2 (exp). Cooldown - 5s. Mortar. Damage - 70 (direct hit - 200). Radius - 6.2m. Falloff - 2 (exp). Cooldown - 2.35s. Tentacle grab. Damage - 10. Maximum grab range - 6.5m. Cooldown - 5s. All melee attacks except for the Claw attack (right handed melee attack) do full damage to the players - x1 and only vary by the possible amount of the hits. Claw attack does x0.5 damage. Heal threshould - 50%. Autoheal threshold - 25%. Cloack charge - 60s (when auto-healed - 45s). HP to restore, of max health: phase1 - 100%, phase2 - 100%, phase3 - 90%. This page was last edited on 6 February 2019, at 18:53.